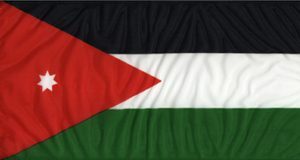 The Flag of the Hashemite Kingdom of Jordan, in its current form, was adopted in 1922. It is inspired, in shape and colours, by the Great Arab Revolt’s banner, which was raised from the plains of Mecca in 1916. Its black, white and green colours represent Umayyad, Abbasid and Fatimid cultures, the most important eras in Arab Islamic civilisation; while the red chevron encompassing the flag’s components represents the Hashemite Family. The heptagram at the centre of the chevron symbolises the seven verses of Surat Al Fatiha, the opening chapter of the Holy Quran.